This weekend is the Ubuntu Global Jam happening all over the world with 31 LoCo Teams participating across 22 countries. Be sure to find an event near you! Much of the fun of an Ubuntu Global Jam event is keeping up to date with what is going on around the world and knowing things that you can do at your event to help Ubuntu. A list of fun tasks you can work on to help Ubuntu 12.04. This covers a range of different topics and there is something for everyone! A built in chat window so you can chat to other Ubuntu community fans all over the world and see what is going on at their jams. A regularly updating collection of photos from flickr, picasa, and pix.ie that are tagged with #ubuntu. Be sure to take plenty of pictures, put them online and tag them! 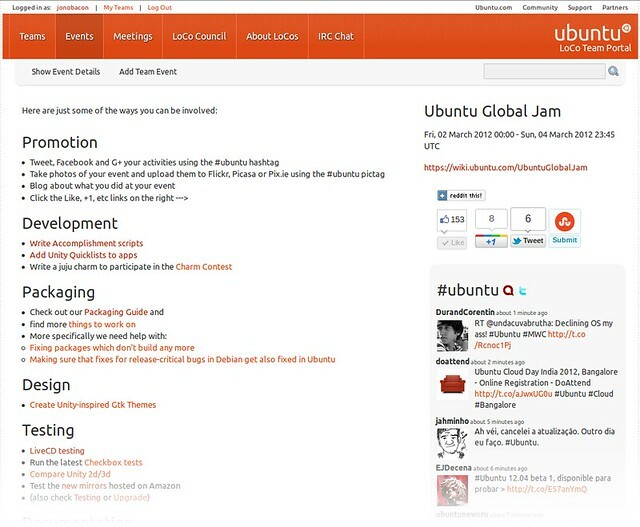 Thanks to Michael Hall and daker for their efforts on the dashboard, and thanks to Charles Profitt, Randal Ross, Laura Czajkowski, Benjamin Kerensa, Daniel Holbach, David Planella, Jorge Castro, and many others for helping to promote and raise aware of the Ubuntu Global Jam. Have an awesome weekend, folks, and thanks for contributing to Ubuntu!